If I were a superhero, then books would be my faithful sidekick. Books have proven to be loyal companions of insight and inspiration and I carry one with me wherever I go. One of the reasons I became a teacher was my love for reading and my desire to ignite that passion in others. Then came the hard work of navigating through the many reasons why some children struggle with reading and finding workable solutions. Teachers have many resources and strategies, but developing skills takes time. Encouraging and incenting children to read for at least twenty minutes each day is a proven way to increase and enrich vocabulary. As children move past third grade they are reading to learn, rather than learning to read. Comprehension skills become vital across the curriculum. The daily read aloud is one way to strengthen both vocabulary and comprehension skills in all children, regardless of their reading ability. I must admit it is one of my favorite times in the school day and I know my students agree. When our class returns from lunch and recess, we settle in, and turn off all but one of the overhead lights. The mood is relaxed with a slight tinge of anticipation, as my students make predictions about what will happen in the story today. 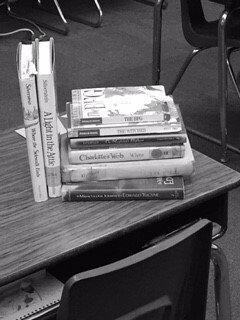 The books on my read aloud list include classics (Charlotte’s Web), classics in the making (The Miraculous Journey of Edward Tulane) and an assortment of stories that lend themselves to children’s imaginations. The books introduce different genres, flights of whimsy, and spark genuine straight-from-the-belly laughter. #10- Esio Trot by Roald Dahl: A charming story of one man’s search for love and the tortoise who makes it possible. #9- Where the Sidewalk Ends by Shel Silverstein: Poetry for both children and adults, filled with humor and whimsy. The illustrations are delightful. #8- Louise, The Adventures of a Chicken by Kate Di Camillo: A chicken, the high seas, a fortune teller and a circus. Enough said! #7- A Series of Unfortunate Events (Books 1-3) by Lemony Snicket: A story of three clever siblings trying to outsmart their nemesis, who pops up in the least likely places in the most ridiculous disguises. #6- The Book With No Pictures by B.J. Novak : A book that requires the reader to say nonsense words and odd phrases with hysterical consequences! #5- The BFG by Roald Dahl: Who can resist a dream catching, friendly giant and a little girl saving “human beans” from nine other hungry giants? #4- Memoirs of a Hamster by Devin Scillian: The misadventures of a hamster, tricked by the family cat to explore beyond the confines of his cage. Like Dorothy, he learns there’s no place like home. #3- Press Here by Herve Tullet: Two words; engaging and interactive! Every page elicits a smile and laughter. #2- Charlotte’s Web by E.B. White: A wonderful tale that defines the essence of friendship. #1- The Miraculous Journey of Edward Tulane by Kate Di Camillo: A china rabbit discovers the importance of an open heart and the healing power of love. It seems there are never enough hours in the school day to get it all done, but I encourage all teachers to make the time for a daily read aloud. In addition to improving reading skills and being a wonderful way to bond with children, a daily read aloud provides a window of respite to quiet the mind. This relaxed state actually improves retention of newly learned material, according to numerous studies on stress and cognition. The daily read aloud is a win-win for time-crunched teachers! Pay it forward. Grab a favorite book, get comfy, and read to a child today. Peggy Alfano teaches third grade in Mesa, Arizona. Ms. Alfano is currently working on a murder mystery novella. She is a member of the Society of Southwestern Authors, Valley of The Sun Chapter and the Women’s Novel Fiction Writing Group. Weekday afternoons you can find her reading aloud in room 7. I love Louise, The Adventures of a Chicken and few people ever talk about it. I am so glad to see someone else feels the sam way I do about Louise. Daily read aloud is a great way to build a community of readers and to ignite children’s passion for reading which is so important. I love many of your selections, and, for many years, I have shared the timeless tale of Charlotte’s Web with my students never tiring of its important message about friendship. It exciting to read blogs and actually know the blogger! Peggy – I so love that you do a daily read-aloud. As an author, that warms my heart in more ways than you can imagine. Your read alouds will stay with those children all their lives. I agree that this is a soothing experience for the kids and the teacher. I’m enjoying your blog and look forward to your next one! How wonderful! I am in Ecuador and was reading to a class of non-native English speakers for the past few months until we finally opened our new library. I am excited that the kids are happy to have books to check out, but I miss reading to them. Glad to know I am not the only one who enjoys that time and that it has a valid educational purpose. I’m glad teachers still do read alouds. Curriculumn is more difficult today with common core and it is important to give students brains a rest during their school day. I definitely agree. In my early childhood, I did had difficulties with comprehension. Both my teacher and my mom would read to me. It provided quality time, definitely bonding time and helped me focus. The reader also made it fun. One of my favorites is “Where the Sidewalk Ends”.